That was quite a precise advise from Mark Polino about Fixed Assets Setup Option. Mark’s article, Putting the Fix in Fixed Assets, saved my day today literally. The advise, which saved me, is not in the article but in one of Mark’s reply to a query from a visitor. The issue is this: When I add a new Asset and run the GL Posting, it did not clear FA Clearing Account and add the cost to FA Cost Account. Typically, FA Clearing Account Debit to FA Cost Credit. In a nutshell, FA Company Setup has got an option called Require Account which needs to be checked. This will make sure that you enter an Asset Account Group or all FA Accounts separately. 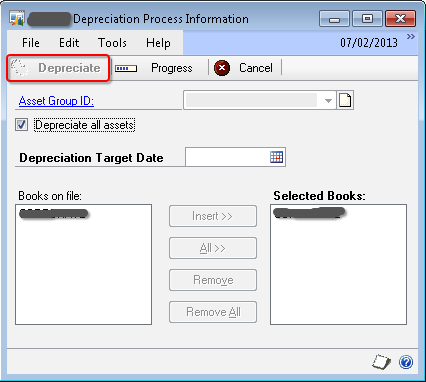 The reason why I overlooked this option: When I integrated Fixed Assets onto GP10, and ran the GL Posting, it was working perfectly without any issues. That time Require Account option was not checked as my understanding towards this option was completely in different context. Anyways, I thought I would re-blog Mark’s post for those who are struggling to understand this point. And, Thanks Mark. You saved my day.